11:19:00 AM I've seen a lot of mountain dewbacks RIGHT outside of Mos Eisley on the Bria server. Also they really do tend to like mountains, you'll usually see them on flat plateaus high above normal terrain. 1:21:00 PM That does seem odd. Did you help it out against the rats? 9:57:00 AM I agree. This is my primary mount, though I do have a Wasteland Cu Pa. These can also defend themselves in combat. You can also pull missions for them in Mos Entha, if memory seves. 9:37:00 AM I got a MCH to fully train this for me and use it a a regular ride. Its fabulous. Worth seeking out. 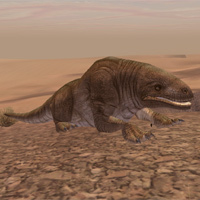 10:02:00 PM i have this pet as my ride and use in hunting bantha and bull ronto, Stick it between you and them and its a brick wall best pet ever ! 9:02:00 PM For 1 lvl higher then a regular Dewback, is much better with 1k more HAM and higher resist's.